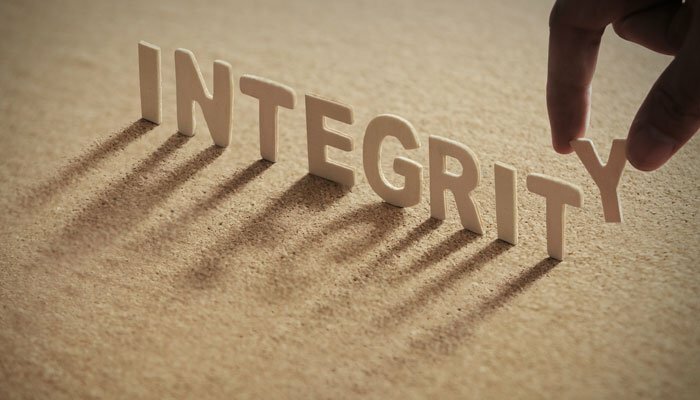 As presented in Part 1 of this blog, Integrity remains a messy issue to address in organizational life. These times of volatile change demand the stability and consistency of systems and people with integrity. And yet, the way we view integrity, makes it complicated to address. This two-part blog revisits integrity. In the last blog, we explored it as a function of our word. I asked that we consider this question: What’s our word worth? 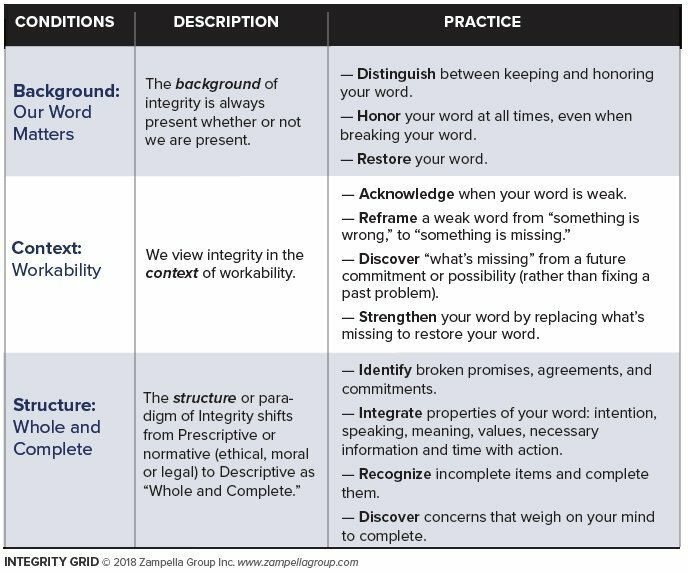 I examined how we can view integrity from a different paradigm: from the background that our word matters, in the context of workability, and structured as whole and complete, as presented in this grid. 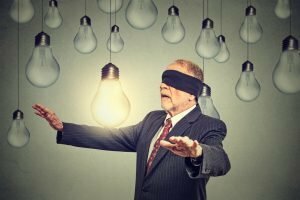 In this blog, I examine seven blind spots of integrity. Together, these two blogs present practices in a framework to strengthen our integrity. Given our definition of Integrity as whole and complete, let’s examine this idea of being complete. Being complete is accepting what is and what is not: who one is and who one is not. Completion means having no impediment to empower or being empowered. Whatever you can’t hear or can’t listen to, remains incomplete. Whatever is in the way of total respect and dignity between you and another human being, remains incomplete. Completion leads to being whole. In this sense, completion is more akin to freedom than finished. Whether finished or not, you are not complete with anything you can’t allow to be just the way it is. That remark your aunt made about looking a little heavy (that you laughed off rather than express what was on your mind). The college degree you stopped short of getting. These are examples of things you may be incomplete about. Consider incompletions like holes in the water glass of life. Until these holes are filled (completed), one can never have enough water to keep their glass full. When we are incomplete we begin to tolerate incompletes for ourselves and from others. We also settle for less — most damaging is we begin settling for less from ourselves, which can cause repercussions that lead to soul-crushing realizations. We define integrity as whole and complete. It is important therefore to gain competency in completing items, not leaving things hanging for others, or remaining as unexpressed thoughts or concerns on our minds. Our competency with completing items often involves necessary conversations to restore our word to others or to remind ourselves of promises we made to manage our lives. Our view of integrity points to missing conditions, not ethics, morals or virtues, so that we can restore our word. Restoring our word matters for creating workability in our lives, for building trust, and to affirm agreements that form our relationships. Consider this: In a world where actions speak louder than words, talk is cheap. Keeping our word is challenging work, but it becomes easier when we recognize several blind spots of integrity. Based on my work and research with students and clients – on keeping and honoring our word – I find dealing with these seven blind spots can build competency in strengthening our word. Conflating virtue with integrity will close off any possibility of communication when we break our word and mask any incomplete item we tolerate. Perfection also personalizes the notion of integrity (being whole and complete) as our virtue and causes us to live life by avoiding mistakes or acknowledging gaps. Can you see the lack of freedom that imposes on us? The most profound learning for humans happens in the gap between actual and aspirational. When we freely explore that gap, we can become more fully human. Perfection forecloses that possibility. — If we view life through a normative lens, we concern ourselves with what’s wrong, and how to fix it. To be perfect means that problems should not exist, so we avoid or deny them, or seek out prescriptions to fix them. — If we consider this descriptive view, we are concerned with what’s missing or essential to bring forth a designated possibility, and how to create it. Problems are inevitable and universal, so we invent possibilities. When maintaining integrity is wrapped up in virtue or perfection, we cannot see or acknowledge when we are not going to keep our word or clean up any related mess or impact. The possibility of being out of integrity is such a threat that we avoid it (like it was when you were a child), rather than accept the challenge to deal with it. When we fail at keeping our word, most of us fear the possibility of looking bad and the ensuing loss of power and respect. We choose the apparent short-term gain of avoiding this fear by hiding that we cannot or will not keep our word. We choose to fake it so we can look good, which often has us look bad. This fear blinds us to the dignity and respect that accrues from the possibility of “honoring” our word, which often entails not keeping one’s word with integrity (see the last blog). See Blind Spot #7. 3. Not Organized to Honor Your Word. In strengthening our word, an area to look at is our organization. Consider that we are unable to keep or honor our word because we lack information to complete tasks or to uphold agreements. Consider that we are organized for many reasons: to be neat, for aesthetics, for ease and comfort. An upgrade here may require this intention: to be organized for workability. This requires the ability to coordinate action with another person such that I can get my hands on what I need when I need it. 4. That Your Word is NOT YOU. The denial or avoidance here is problematic. This blind spot deceives us into believing that what we say is divorced from who we are. Accepting that you are your word is challenging and will expand your view of yourself as co-creator of your reality. Do what is expected of me by all those with whom I wish to have a workable relationship. Do what I say is so because I said so. Stand for what I say I stand for. 5. Not Grounded in Time. — How do we deliver on our word or follow through on items or projects? For instance, I sign agreements with promises to act on payments or activities, I promise to deliver specific items to colleagues, or I make requests or offers to forward ideas or action. All these situations require honoring time as deadlines, timeframes, plans, predictions, or expectations (such as ASAP). — How do we live our word in the present moment? Do we act in ways that demonstrate our espoused values, intentions or declarations to ourselves and others? All of this shows up in each moment of our lives. How do I show up for meetings, calls, conversations? Am I on time, ready to contribute? Do I show up as the person I’ve declared myself to be? Am I revealed as the leader others might expect of me? — Time Reveals Awareness. This may seem backward. Most of us are concerned about our awareness of time, but what if time itself reveals our awareness of our self and our choices? Cognitive dissonance will find us thinking one thing, saying one thing and doing something else altogether. This is the actual definition of out of integrity – not being whole and complete. Using time as an objective measure of our word (through calendars or other scheduling systems) reveals our choices and intentions. We all have the same 24-hour day. How we show up is less about that 24-hour period and rather reveals the choices that lead to broken agreements and incomplete items. In essence, “Time” discloses gaps in awareness of our actions, promises, or intentions. 6. Not willing to Break my Word (that integrity equals keeping my word). This blind spot may seem off for strengthening our word. It is similar to #2. Here we explore competency with breaking our word. At some point, we’ve judged this as inappropriate for ourselves and set this standard for others. We deny or avoid when we must break our word. Given the state of uncertainty and our human nature, we can expect that leaders who are creating unpredictable futures will break their word (will not be able to keep it) because they must operate in the unknown. When we seek only to keep our word, we will either feel trapped into keeping our word in the face of changing conditions; or, we will avoid the risk and uncertainty that may cause us to break our word. Both options leave us fixed, rigid and constrained because we do not believe we can break our word. Here’s the paradox – leaders that never break their word are playing a comfortable game, advancing a very predictable mission that requires little risk, predictable change, and ultimately no possibility. While it’s unavoidable that we will break our word, we can ALWAYS honor our word. 7. Struggling with this Alone. Paradoxically, acknowledging that we have a weak word, frees us of the need to prove anything or to impress ourselves or others. It opens an inquiry into which situations may reveal our weak word and begins the work of strengthening it. Such an inquiry reveals strength and invites support. Honoring one’s word is simple and available for everyone, but if it were easy, I wouldn’t be writing this blog. We’ve made this a complicated ideal, rather than an accessible social practice. It is loaded with morals, ethics, and virtues, and fraught with embarrassment and shame. STOP taking on your integrity by yourself, all alone! The only way to create a system for a strong word is to include others in a social practice with you. Invite others to hold you accountable and then hold others accountable to their word. Pause before saying yes to promises and be clear that your yes is an intended yes to actual completion. Acknowledge when you’ve received requests from others, even if you cannot respond to their request. This reduces uncertainty about you, and for them. You can always set another time to respond to them regarding specifics of their request. Ask others to send a follow-up email, 24 hours after they make a request if they’ve not heard from you. Now, you can acknowledge receipt, and then either accept, decline or negotiate the request. And when others hold you accountable, thank them, and show appreciation. That person is someone you want in your life. By enrolling others in supporting us to strengthen, restore and honor our word, we can, together, increase performance, enhance relationships, and expand trust.